Dynamite explodes inside a massive West Roxbury quarry many times each week, rattling plates in nearby homes and jarring nerves in this far-flung section of the city. But now, neighbors say they have something new to fear. A Houston energy company is planning to build a $1 billion natural gas pipeline through the neighborhood along with a gas pressure regulating station across from the quarry. Residents fear the underground transmission pipeline could one day rupture because of relentless blasting at the quarry, causing catastrophic harm to families, schools, and a nursing home nearby. Spectra Energy Corp., the Fortune 500 company planning the West Roxbury pipeline, said it has a clean safety record. The pipeline would be designed, constructed, and maintained to meet federal guidelines and would not interfere with the safe operations of the quarry, the company said. Spectra has not had a safety violation involving death or injury since 2006, but has amassed more than $350,000 in fines for failure to inspect transmission lines, according to recent data from the US Department of Transportation, which has a unit that regulates pipeline safety. “Spectra Energy has been operating safely in the New England region for more than 60 years,’’ company spokeswoman Marylee Hanley said. The West Roxbury gas line issue, simmering for two years, has gained steam recently and pits residents against one of North America’s largest pipeline companies, whose customers include NStar and National Grid. It has also generated broad — and uniformly negative — responses from the political class, with Boston’s mayor, a US representative, and officials from at least one other community rallying against the pipeline. The burst of opposition comes as Spectra nears the end of a lengthy application process aimed at securing crucial federal approval for the planned gas route into West Roxbury, which is being built at the request of National Grid as it struggles to satisfy surging demand for natural gas. National Grid said it needs to increase the volume of gas it delivers to West Roxbury residential and business customers who have endured outages and hiccups in service. To meet the needs of National Grid, Spectra proposed building a connection to its massive Algonquin Incremental Market Project, a 1,127-mile natural gas pipeline that runs from New Jersey through New York, Connecticut, Rhode Island, and Massachusetts. 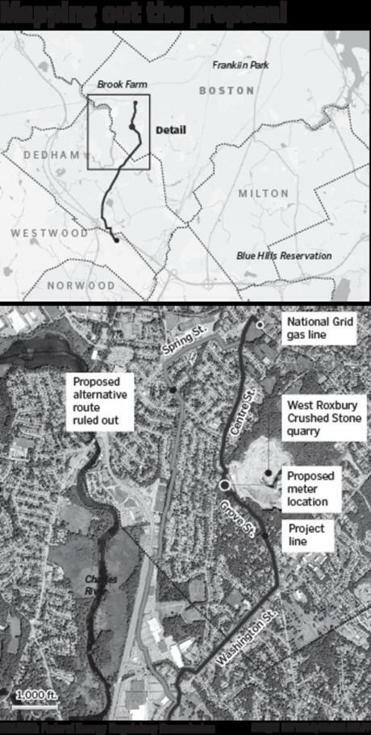 The proposed 5.1-mile spur into Boston would snake underground from near a golf course in Westwood, passing Legacy Place shopping center and a soccer field in Dedham, and winding under densely packed areas along Washington, Centre, and Grove streets in West Roxbury — where it would connect into National Grid’s existing gas lines. Spectra has held open houses and public information meetings on the pipeline since 2012. In 2013, the energy company acquired land from the quarry’s owners, West Roxbury Crushed Stone Co., on a patch of Grove Street outside the pit, where trucks rumble in and out, and blasts are common. The energy company intends to build a metering and regulating station on undeveloped land outside the quarry’s entrance on Grove Street. After quietly sailing through a public notification process, Spectra formally applied to the Federal Energy Regulatory Commission last February for approval for the new line, called the West Roxbury Lateral Alternative Route. The regulatory commission released a draft environmental impact statement on the project in August, and a final version is expected in January. A decision on whether to authorize the pipeline is not expected until the spring. If approved, the pipeline extension would begin operating by 2016. Some West Roxbury residents active in neighborhood and environmental issues said they did not know about the pipeline until late in the process and were stunned it had been proposed. Others, including Harvey, who runs the environmental group West Roxbury Saves Energy, have been demanding that Spectra answer safety questions, including what precautions will be taken to avoid an explosion along the line. She said she is still waiting for answers. The draft environmental statement notes some safety risks associated with the project, but declared they were not significant. Federal regulators analyzed the schedule and logistics associated with having construction and operations existing so close to the quarry and found “no direct conflicts” that would inhibit the project or continued operation of the quarry, the document said. 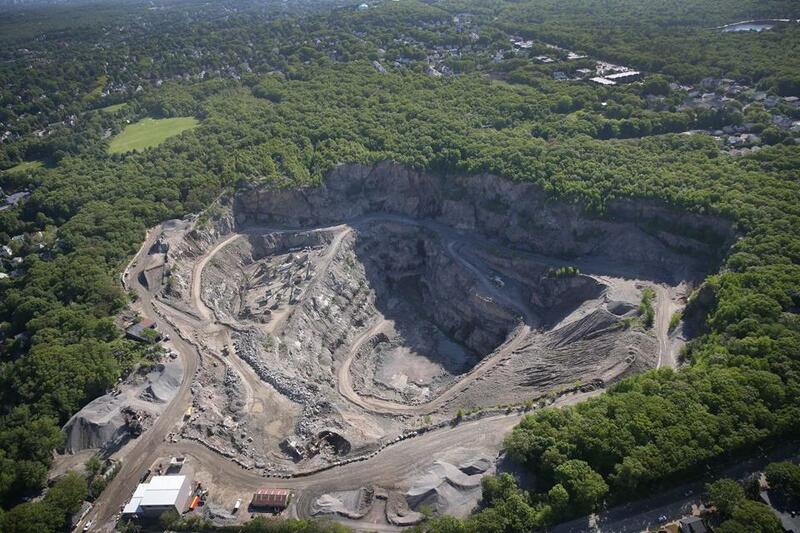 Spectra retained consultants at GeoEnvironmental Inc. to analyze the potential effects on the proposed project from quarry blasting, including ground vibrations, air vibrations, hydrogeologic disturbance, and projectiles such as flying rock. Spectra said it would bury the pipeline about 5 feet underground. Its pipeline would be coated with high-strength steel and enveloped in either compacted sand or a low density concrete-sand mixture to support the pipe and serve as a barrier from any problems. In recent years, Spectra has faced a series of warnings and threats of lawsuits from the US office that regulates pipeline safety. In 2010 and 2011, documents show, the company’s Algonquin Gas Transmission LLC paid $154,700 in fines for failing to inspect transmission line valves, retain records of internal corrosion inspections for five years, and check pressure regulating stations. Spectra’s Texas Eastern Transmission LP company has been fined $361,900 since 2006 for inspection violations, including lack of corrosion control and maintenance, federal documents show. Spectra has addressed problems identified by the US Pipeline and Hazardous Materials Safety Administration and takes the agency’s recommendations “very seriously,” the company spokeswoman said. Since learning of the proposed West Roxbury spur, residents have been pushing elected officials, including Mayor Martin J. Walsh, to take action. Groups such as the Committee to Stop the West Roxbury Lateral Pipeline have formed to fight it. And in Dedham, selectmen voted 5 to 0 to oppose it. Joseph M. Lovett, a West Virginia environmental lawyer, said residents have clear reason to be concerned. US Representative Stephen F. Lynch has written letters to the chairwoman of the Federal Energy Regulatory Commission, citing “grave concerns” about the project. Walsh and Boston councilors have joined the opposition chorus. Lynch said he met with Walsh staff members and Spectra officials, and urged the energy company to take a fresh look at the route. But Hanley, the Spectra spokeswoman, said the decision on the route is up to the regulatory commission, which has yet to decide. A spokeswoman said the commission will consider all input submitted to it. Hanley and a National Grid official contend that neither the pipeline nor the planned metering station next to the quarry pose any danger.